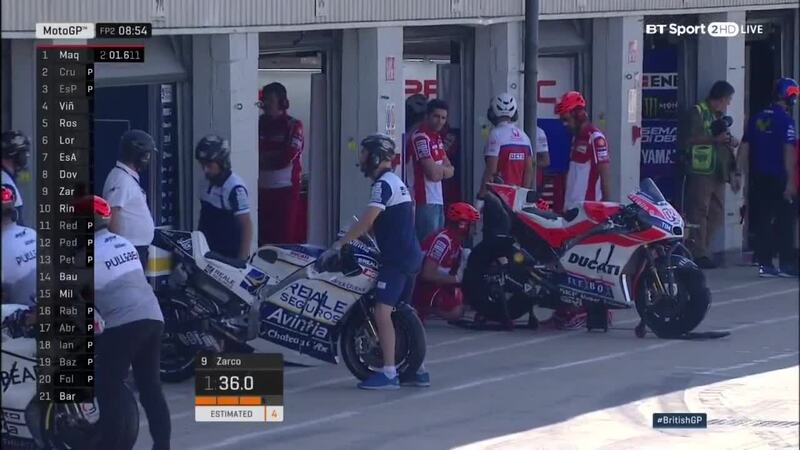 Incredible Cal Crutchlow got his time blaster in the last 5 minutes of the Free Practice two (FP2). He looked like he did not believe it himself. 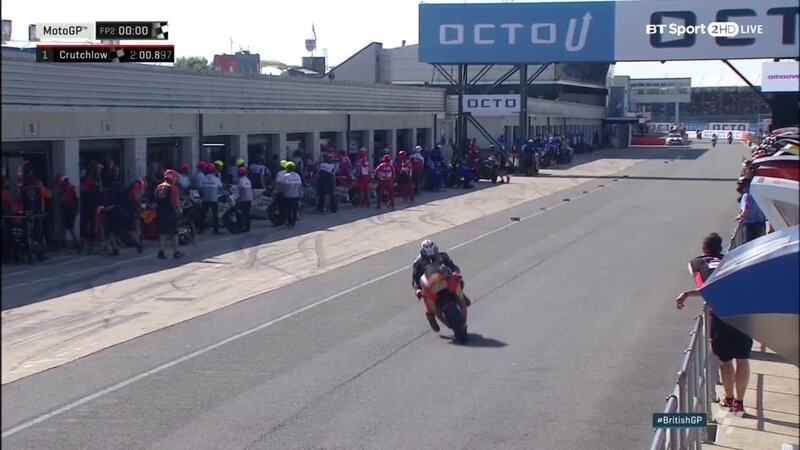 Rossi looked a good contender in the end but lost much time in Sector four; who know why. 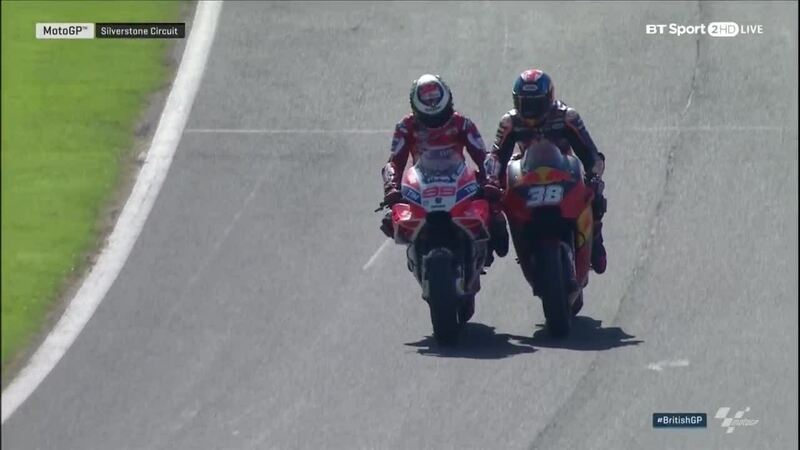 Viñales finishes in third; shortly behhing his team mate. Fourth fastest on combined timesheets was an impressive showing from Aleix Espargaro (Aprilia Racing Team Gresini), ahead of reigning Champion Marc Marquez (Repsol Honda Team). 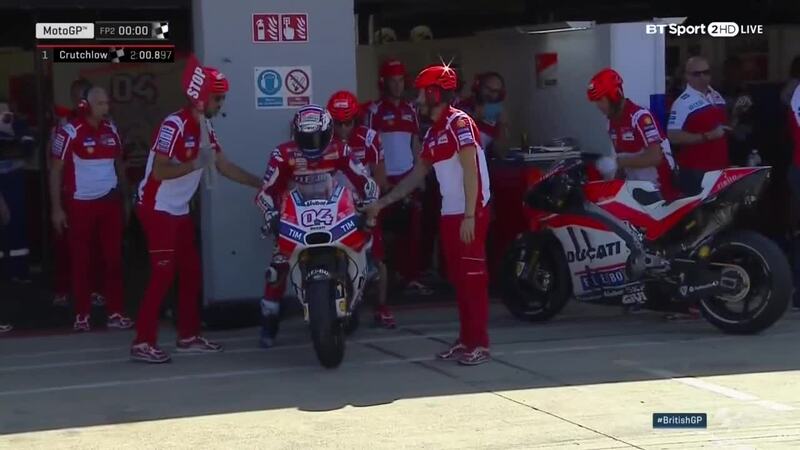 Marquez had two crashes in the afternoon, but got back on track – rider ok. Jorge Lorenzo (Ducati Team) was the fastest Borgo Panigale machine on Day 1 in P6 overall. 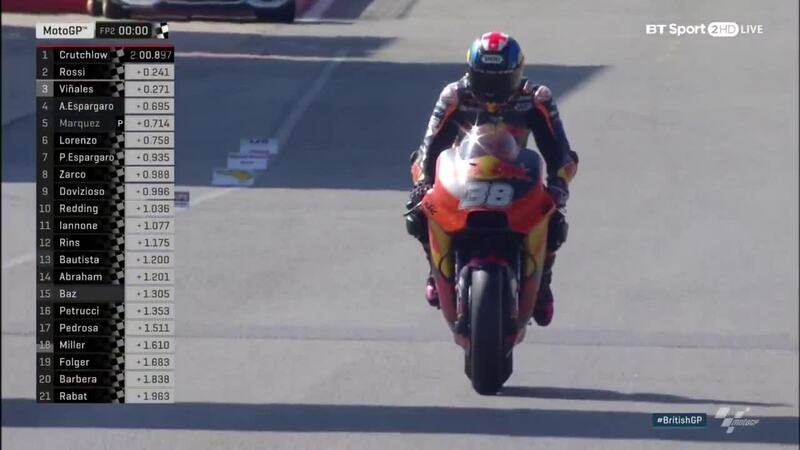 The Majorcan is also the man with the most premier class victories at the track – and got back to pitlane at the end of FP2 with a little help from Bradley Smith (Red Bull KTM Factory Racing). 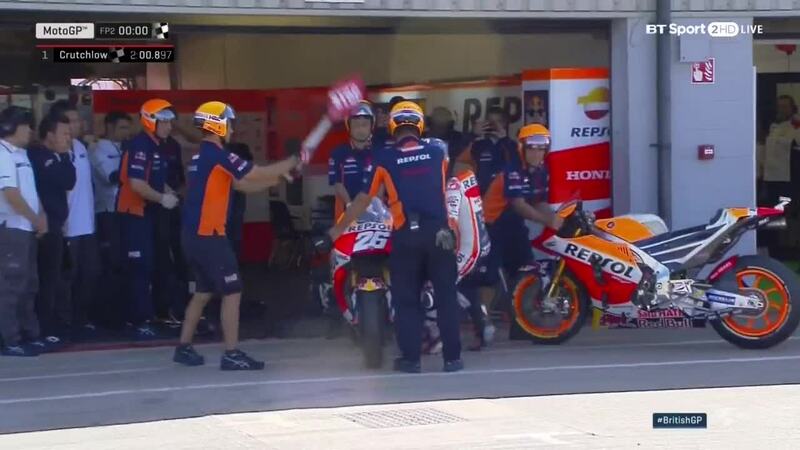 FP2 was also marked on Friday by a trial run of a new flag-to-flag bike swap procedure at the end of the session, with team’s given a new angle for the bikes and a lollipop man in place to ensure safe releases. The Safety Commision will now discuss the trial. Red Bull KTM Factory Racing rider Pol Espargaro put in a rockstar performance on Friday, running third for some time in FP2 before ending the day in seventh. He headed rookie Johann Zarco (Monster Yamaha Tech 3), who was eighth fastest as he attempts to keep his momentum from Austria. 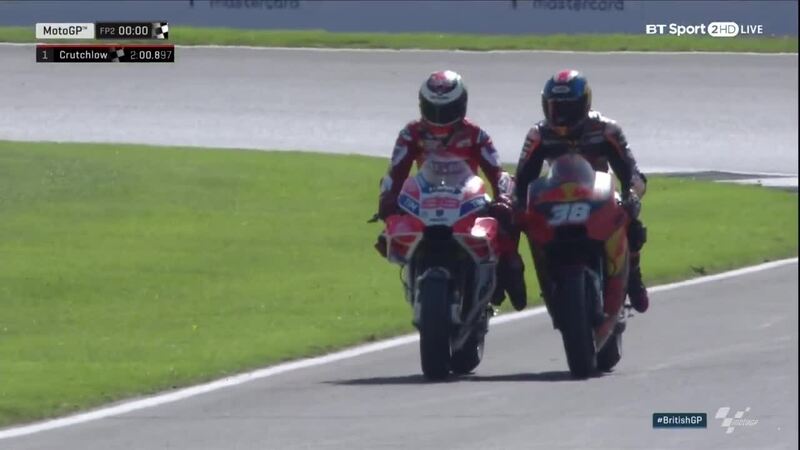 Andrea Iannone and Alex Rins (Team Suzuki Ecstar) were P11 and P12 respectively at the track where the GSX-RR won last year, with the fastest fifteen on Friday completed by Alvaro Bautista (Pull&Bear Aspar Team) , teammate Karel Abraham and Loris Baz (Reale Avintia Racing). 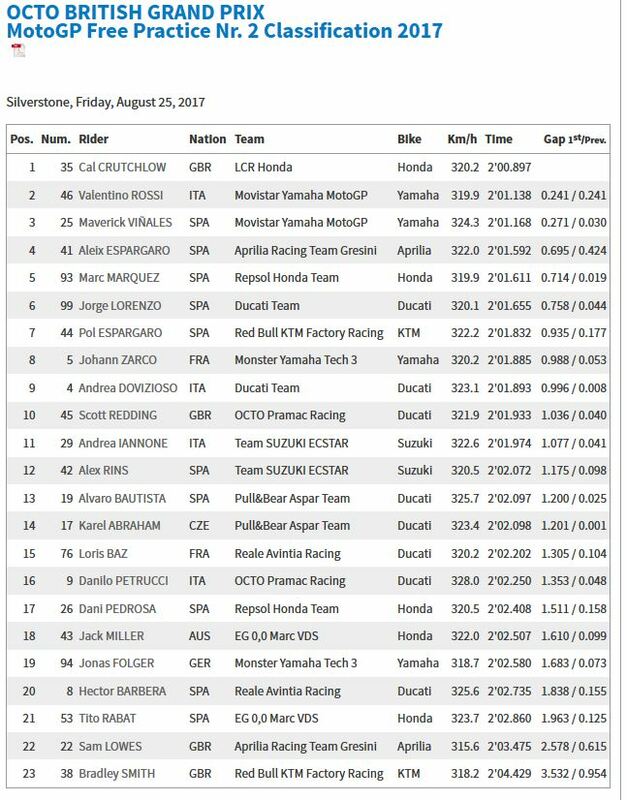 Two big names further down the timesheets were Dani Pedrosa (Repsol Honda Team) in P17 and Jonas Folger (Monster Yamaha Tech 3) in P19. 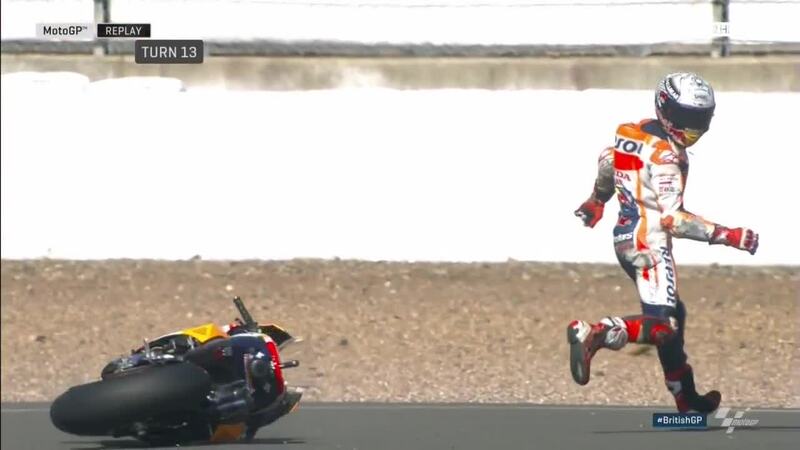 Up to then, Marquez seemed to have all over his hands, but he lost his RCV in the last minutes and apparently had no much time to remount and try beating the Beautiful Honda Castrol of the local hero Cal Crutchlow. 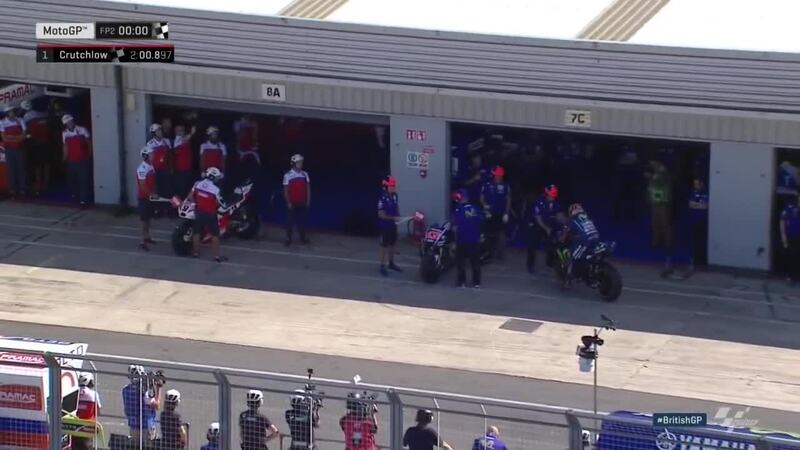 Very interesting too was the new procedure to swap bikes under flag-to-flag race and tho it seems orderly when practiced; it could just turn out as the same mess within a race; in our opinion. Future will probably give a different verdict and we hope for the best. Valentino Rossi (Movistar Yamaha MotoGP) has been getting faster and faster at Silverstone since the venue returned to the calendar in 2010, including a wet weather win on 2015. 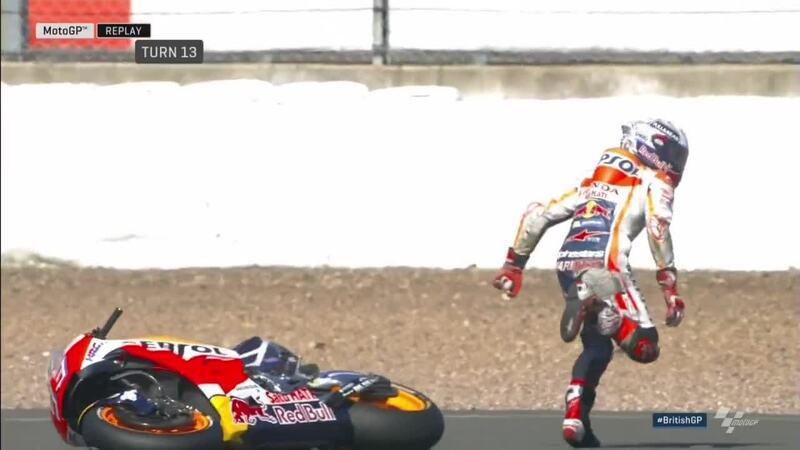 That pace was on fine form on Day 1 this season, as the nine-time World Champion went second quickest overall – behind only home hero Cal Crutchlow (LCR Honda) and in front of teammate and 2016 winner Maverick Viñales. 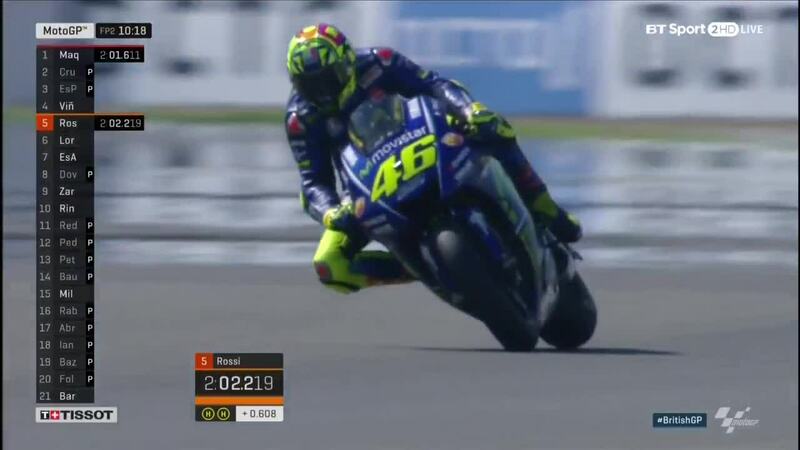 Valentino Rossi, P2: “It was a good day for us. 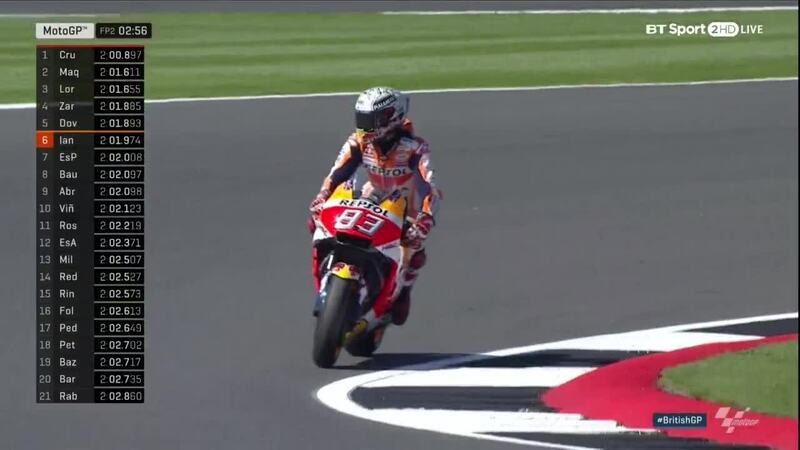 First of all, arriving at Silverstone with this incredible weather I’ve enjoyed a lot because this track is fantastic and it’s a big surprise! I’ve enjoyed it also because I’ve had a good feeling with the bike from the first lap, like can happen a lot throughout the season when I have a good feeling, then some other times I suffer more. But we were able to work a lot on the tyres, I’ve worked a lot on the used tyres. It looks like this year the three options for the rear are very open and it’s important to make the right decision for Sunday – which depends a lot on the temperature. We have good pace including on used tryes, when I’m still competitive and my laptime is constant and quite fast. We’ve started in a good way. We have a lot of work to do, a lot of tyres to choose, but we already have good speed and I’m very happy. 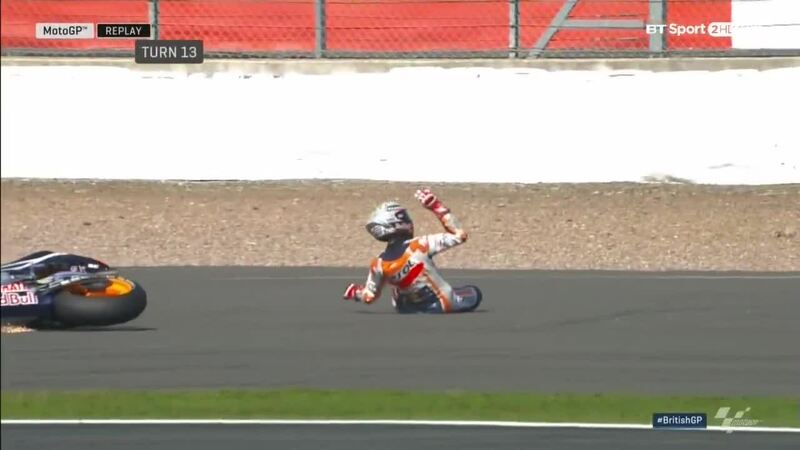 Marc Marquez (Repsol Honda Team) suffered two crashes on Day 1 at the Octo British Grand Prix, but the reigning Champion nevertheless set the fifth fastest time on the combined timesheets – and has some ideas for improvements tomorrow. 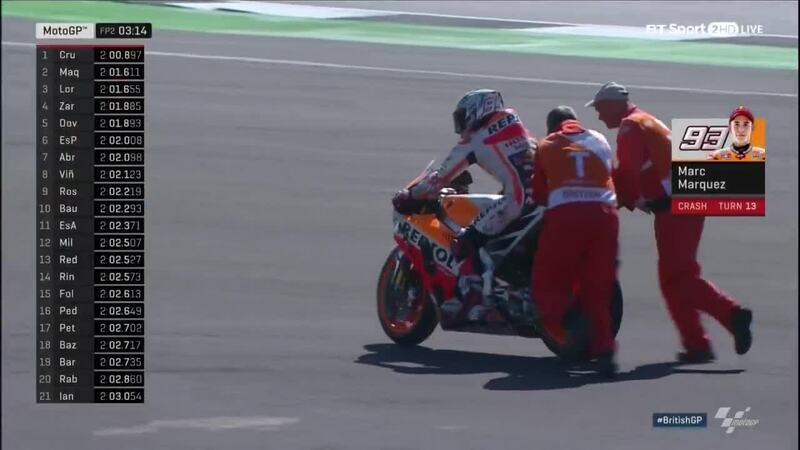 After doing most of FP2 on his second bike and a different setup, it wasn’t an ideal start – but Marquez retains he found a good rhythm and remains a serious threat. Cal Crutchlow (LCR Honda) had a storming start to his home GP, taking P1 on the timesheets and leading the way. 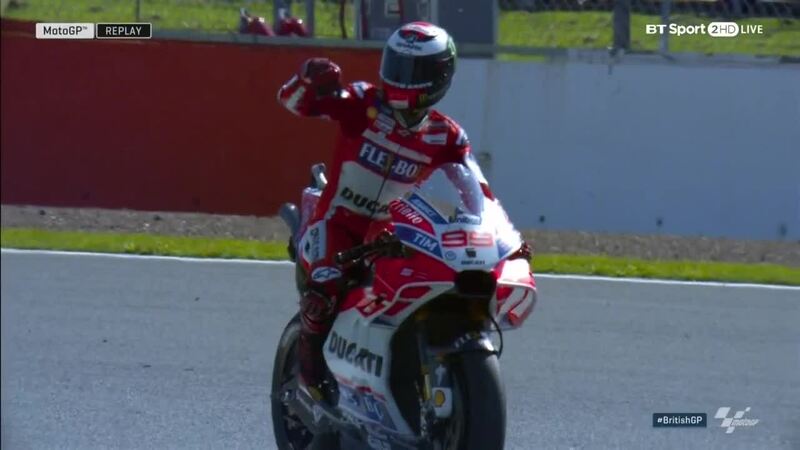 On pole last year and then taking second in the race, the Brit has good form at Silverstone of late – and it looks like that has more than carried into 2017. Despite the top start, the LCR rider says there still seems to be some doubt as to whether he’ll have podium pace on Sunday – saying the Movistar Yamaha MotoGP pairing of Valentino Rossi and Maverick Viñales look like a serious threat – and that there’s no doubt Marc Marquez (Repsol Honda Team) will be there in the mix at the front.